Learn about plans and pricing. Forward Slash Technology offers the tools of big businesses to our customers at a small business price through Microsoft Office 365. You can get powerful tools such as: Microsoft Office, including cloud-based, professional e-mail (Outlook), Word, Powerpoint, Excel, and OneNote. With features that allow you to connect from almost anywhere, you can use a mobile device, your PC, or simply the Web. Video conferencing options, instant messaging, presence indicators, and lync-to-phone allow any office to stay connected. File sharing, Web site help, and impeccable security will help your business maintain the professionalism that you are proud of. Microsoft Office 365 is a subscription based service per user; Microsoft Office 365 can save the SMB and even Enterprise Level Business' from having to worrying about individual user licenses and specificity of station licenses. Find out if Microsoft 365 is right for your office. To learn more about our St. Louis IT services and IT support for office 365, contact our IT company today. What are some benefits of Office 365? Proven reliability to limit downtime and ensure maximum availability of service - Microsoft Office 365 has 99.9% uptime. Enterprise class security - small businesses can now experience the kind of cloud security only enterprises have thus far enjoyed. Setting up Office 365 for your organization provides first class data recovery solutions as well as Microsoft's security. Microsoft Office suite - make it easier to collaborate with others in the organization with clean documents, presentations, and more. Available everywhere - your Microsoft 365 subscription is available from anywhere that can hook to the Web. Large mailbox storage size - 25G per user. Buy and eliminate subscriptions at your need, rather than purchasing seats. Microsoft 365 allows easy administration including adding and deleting users, resetting passwords, and adding the services you need for each subscription. Cost - with a starting cost as low as $4 per month, setting up Microsoft Office 365 for your office will help you break down large start up costs as Office 2013 approaches. Forward Slash Technology can help you get set up with Office 365 today. 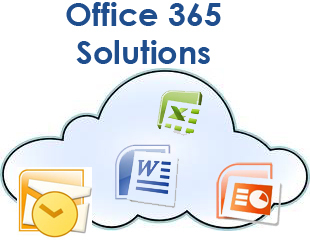 Give us a call at (314)403-1230 or email us at [email protected] to learn more about Microsoft Office 365.